Our Quilts of Valor group meets on the 2nd Tuesday of every month from 10-1. They work on patriotic quilts that will be donated to veterans. nteers, and donors, we transform high quality fabrics into patchwork quilts that offer comfort to children in need. 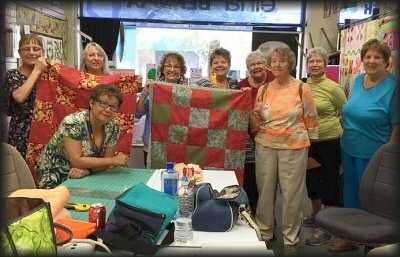 Upland Vac & Sew is a recognized chapter of the organization that has a meeting every third Wednesday of the month where anyone who wishes to donate their time and talent is welcome to come and help create some quilts. Between 10 and 2 you are welcome to help cut, piece, iron or cheer as the group gets as much done as possible. Once the top is done we have a wonderful person who has offered to do all the quilting on her longarm for free. We need helpers who are willing to bind and sew on the labels to the quilts as well. Every few months once we have a good amount of quilts ready to donate we will invite whoever who would like to join to come help donate them at various local places that are accepting donations. If you would like to help by donating your time and skill or if you have fabric, batting or supplies you wish to donate, contact the store at your convenience and let us know! We are also a drop-off site for any quilts and blankets that are to be donated to Project Linus.